Morning! I LOVE this room! As soon as I pinned it I knew it was one that needed to be shared. I am drawn to images where there is such structure but also so much detail. Check out the EAT painted onto the table, fun right? 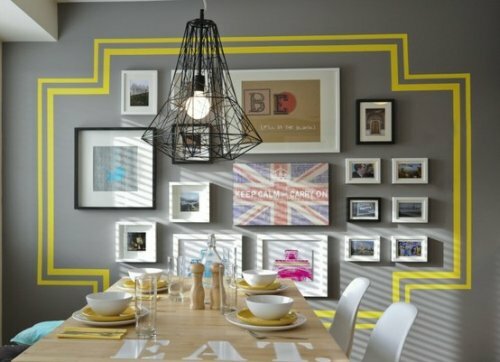 The bits of typography included in the wall decor is so appealing, it is just the perfect amount! Want more home photos plus typography? Check out all the past rooms here! I just fell in love with the Eat. on the table...wondering if my husband would kill me if I went ahead and did it... seriously i want to leave work and go do that to my table. Tara! You make me laugh but I have a feeling you are not joking! If you do it please send over a picture. In our house I have put the breaks on the typography just a bit in a few rooms. Hope you convince the hubby! Love this room! The citron on the walls is so fun. Looks like Palmer Weiss from San Francisco but not sure - I'll check.